The late Bill Rabe, former Detroit newsman and public relations guru for the Mackinac area, is still making news every year. Not only was Rabe the public relations chief for Lake Superior State University, Sault Ste. Marie, Michigan, he presided at press events for Mackinac Island and the Grand Hotel for many years after leaving Detroit. Several times this old time reporter checked in with Rabe at his annual ongoing press conference/cocktail party at the LakeView Hotel along the waterfront on Mackinac Island at the start of the summer season. Rabe's stone skipping championships made international news and his publicity event cleverly disguised as a "banished words" release was widely quoted in all kinds of "news media," to crassly use a concocted term. The PR gimmick he devised lives on after him, no doubt setting a world record for crazy ideas that caught on and persisted. The annual "event" still makes important statements about the tortuous use of the English language in our modern age. His "Unicorn Hunter's License" is still issued by the university, a wry, tongue-in-cheek jibe at Michigan's thousands of deer hunters. The great thing about the banished words project is that you don't have to head north to skip stones, but you can participate by e-mail in the banished words process. This breaking news just in: Lake Superior State University releases its 31st annual List of Words and Phrases Banished from the Queen's English for Mis-Use, Over-Use and General Uselessness. It was during a New Year's party 30 years ago when LSSU Public Relations Director Bill Rabe and some colleagues cooked up a whimsical idea to banish overused words and phrases. On Jan. 1, 1976, with tongue firmly in cheek, Rabe took his first crack at it. Much to the delight (or chagrin) of word enthusiasts everywhere, the list endures into a fourth decade. 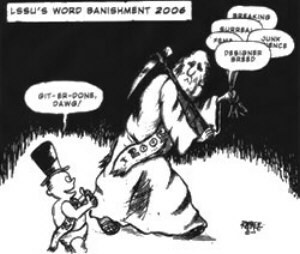 Through the years, LSSU has received thousands of nominations for its all-time list of banished words and phrases, which now stands at nearly 800. This year's list is culled from almost 2,000 nominations received mostly through the University's Web site. Word-watchers target pet peeves from everyday speech, as well as from the news, fields of education, technology, advertising, politics, and more. A committee makes a final cut in late December. The list is released on New Year's Day. SURREAL  One part opiate of the masses, 13 parts overuse. Oddly, news anchor and television small talk isbecoming more surreal. Dreams are surreal, not daily adjectives.  Tracy from Murray, Ky.
HUNKER DOWN  To brace oneself, in anticipation of media onslaught. Trotted out in reports about everything from politics to hurricanes. I have a hankering to ban all of this hunkering.  Kate Rabe Forgach, Fort Collins, Colo. PERSON OF INTEREST  Found within the context of legal commentary, but seldom encountered at cocktail parties. People with guns want to talk with you.  Melissa Carroll from Greensboro, NC. Does this mean the rest of us are too boring to deal with?  Patricia Johnson from Mechanicsville, Va.
COMMUNITY OF LEARNERS  A five-dollar phrase on a nickel-errand. Value-added into many higher education mission statements. Not to be confused with school. '  Jim Howard from Mishawa, Ind. UP OR DOWN VOTE  A casualty of today's partisanship. No discussion on this one; the committee just tossed a coin. I see a bright future for ex-senators as elevator operators.  Allan Dregseth, Fargo, ND. 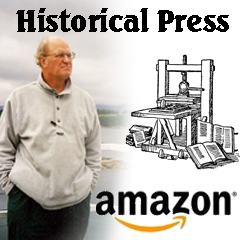 BREAKING NEWS  Once it stopped presses. Now it's a lower-intestinal condition brought about by eating dinner during newscasts. Now they have to interrupt my supper to tell me that Katie Holmes ispregnant.  Michael Raczko, Swanton, Ohio. DESIGNER BREED  Many nominators consider this a bastardization of dog breeding. It may be a good line to use on angry neighbors when an un-neutered dog escapes. When you mate a miniature schnauzerto a toy poodle, it's not a Schnoodle,' it's a mongrel.  George Bullerjahn, Bowling Green, Ohio. FEMA  Dedicated to the memory of a great federal agency consigned to the ash heap of parody. If they don't do anything, we don't need their acronym.  Josh Hamilton, Tucson, Ariz. FIRST-TIME CALLER  Preamble often heard on talk radio. I am serious in asking: who in any universe gives a care?  Miguel McCormick, Orlando, Fla. PASS THE SAVINGS ON TO YOU!  Marketing catch phrase that became a lost-leader long ago. Read: Pass the markup along to you.  C. W. Estes, Roanoke, Tex. 97% FAT FREE  Adventures in delusion. Still has 3% fat . . . accept it.  Andrew Clucas, Canberra, Australia. ANACCIDENT THAT DIDN'T HAVE TO HAPPEN  Best-laid mayhem. This means some accidents need to happen, for whatever reason, I can't figure.  Thomas Price, Orlando, Fla. JUNK SCIENCE  Banished from the Marketplace of Ideas. It's not scientistswho are using this phrase so much as the people who practice junk politics.  Ron LaLonde, Inuvik, Northwest Territories, Canada. DAWG  No designer breed here. Someone should wash out this Spot. Even parents are starting to use it!  complains Mrs. Swartz's Fifth Grade Class in Church Road, Va. This is species confusion.  Rob Bowers, Santa Clara, Calif. Don't call me dawg'! I'm not your pet!  Michael Swartz, Albuquerque, NM. TALKING POINTS  Cover your ears! Topics which will please those you want to impress.  Michele Mooney, Van Nuys, Calif. Joe Wonsetler of Swanton, Ohio, believes the phrase was created after PR staffers stopped attending seminars on how to put a positive spin' on their press releases. HOLIDAY TREE  Many salvoes were firedduring this past season's war on Christmas. At the risk of jumping into the breach, the committee feels that Holiday tree is a silly name for what most folks hold as a Christmas tree, no matter your preference of religion. Thank goodness we all agreeon the first day of winter.